You can select Morning tour or Afternoon Tour. You will visit must-see sights in Tokyo such as the Meiji Jingu Shrine which is one of the most famour Shinto Shrine in Tokyo. and Imperial Palace East Garden and Asakusa where is the oldest temple in Tokyo. 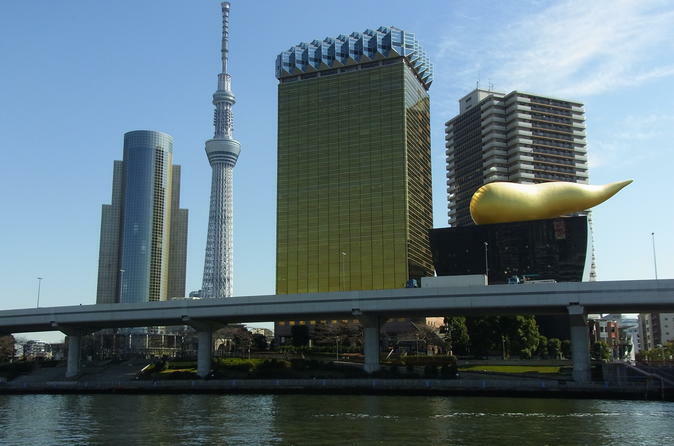 You will visit Tokyo Sky Tree and Tokyo River Cruise. You can go up tot the observation deck at Tokyo Sky Tree directly without waiting time. You can see the beautiful view from Cruise. Both of the tickets are included in tour fee. At first, you will visit the Meiji Jingu Shrine, the biggest temple in Tokyo, enjoy about 40 minutes to see around. You can find any landmarks such as National Diet Building from the windows on the way to next place. Second, you visit the Imperial Palace East Garden, enjoy about 40 minutes. If the East Garden is closed, you'll explore the Imperial Palace Outer Garden and the Niju-bashi bridge. In Asakusa, the best sightseeing spot in Tokyo, spend about 45 to 60 minutes. You will finish the tour at JR Tokyo Station at 13:20. We will depart at Hananomai Edo Tokyo Museum branch in Ryogoku at 13:50 (2019). You will visit the Tokyo Sky Tree, you can go up to the first observation desk(350 m) directly. Also you can enjoy shopping in Soramachi Shopping Mall. <2019>Final destination Tokyo River & Bay cruise will change to Tokyo bay cruise.You can see great views such as the Rainbow Bridge and Odaiba area from the deck of the cruise, it’s a great 360 degree panoramic view. The bus will run through Rainbow Bridge, see Tokyo Metropolitan Expressway and Tokyo bay area from the window before we start cruising. After the tour, you can choose a drop off point, Tokyo station OR Shinjuku Station.